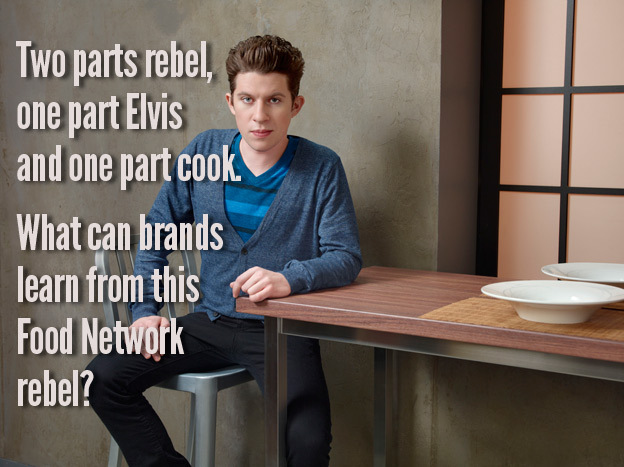 Businesses can learn four key branding concepts from Justin Warner, a chef who has his image down pat–and may be Food Network’s next big star. Mix two parts rebel, one part Elvis and one part cook. Add a sprinkling of New York City bohemian wit, and let simmer for a few weeks and voila!, a star is born. Clients and friends know I am a foodie. As a native New Yorker from Brooklyn, I’m a rebel, a coffee perfectionist, and a good cook (good enough that some friends even call me a chef. Go figure!). All good skills to have when branding companies and cities, their services and their products (my “day job”). So naturally I am attracted to such Food Network hit TV shows such as Chopped, Restaurant Impossible, Iron Chef America and Food Network Star. The shows are well edited, well-paced, entertaining and informative, particularly Food Network Star. I think Bob Tuschman (who in person, per a recent interview, is 6 feet tall and blond) and Susie Fogelson (who I think is a great mix of business exec with a touch of a young Lauren Bacall) are a great pair to lead and moderate the challenges. Branding, like food, is a recipe that has equal parts well-aged passion and freshly picked curiosity. The brand has “depth” to its personality. In other words, it’s not one-dimensional (like learning there’s considerably more to someone you’ve known for a while). Brands can learn a lot from this as you’ll see below. This season’s Food Network Star had one contender that embodied the qualities that make a brand (as well as a TV personality) memorable, welcome, interesting and mentally stimulating. 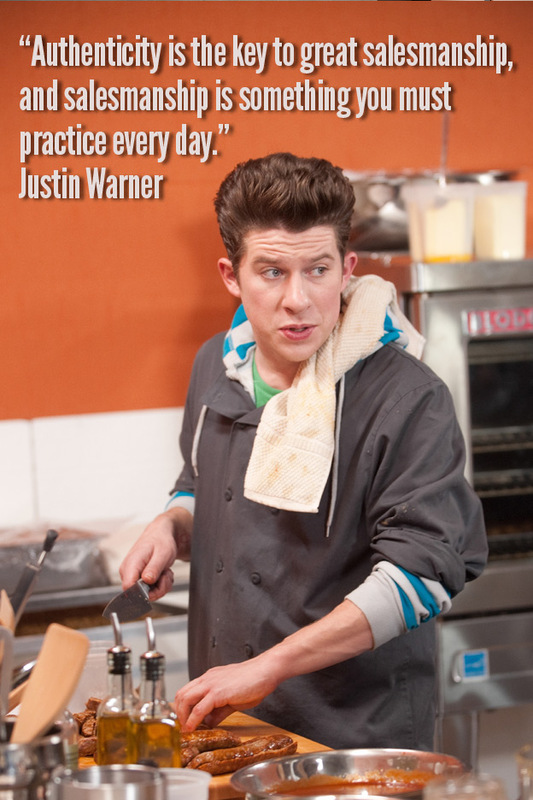 He goes by the self-proclaimed role of “Rebel with a Culinary Cause” and answers to (at least on some formal document like a birth certificate) Justin Warner. And as is proven by case studies (showing how a powerful brand can increase sales 300%), rebellious brands like Apple, Dyson, Jones Soda and Harley Devidson are just a few of the brands that prove its workability day in and day out. He provides enough insight into what he’s doing and how he’s doing it that you know there’s more to him than meets the eye. I tracked Justin down to get some insight from the man himself on what makes his brand so authentically refreshing, with some great takeaways for companies managing their own brand’s voice and authenticity. DAVID BRIER: So, your point of view on Food Network Star is Rebel With A Culinary Cause. Can you specify what you’re rebelling against? JUSTIN WARNER: I am rebelling against the old French chef that lives in America’s collective head that says “Zees is not zee way to cook…” You know what? Anyone can cook, and people shouldn’t be scared to cook, and cooking should be an open-source, inviting, and above all necessary part of our lives. It’s pretty mind-blowing to think that cooking is no longer a requisite for human existence. You have definitive view on how things should be that appears very rock steady. How has this helped you advance your career and “personal brand”? My whole working life has been spent in the FOH (front of house) in restaurants. There is constantly a power struggle between FOH and BOH (back of house). Chefs carry a lot of attitude. The difference between a chef and God is that God doesn’t think he can cook. I am not a chef, I am the anti-chef and I want to prove that this is not some mystical sacred art for an elite few, but a fun game that only requires creativity and hunger to play…. A little over a year ago, I opened Do or Dine’s kitchen with my partner George McNeese. We got praise from The New York Times, Michelin, Zagat, and Forbes in one year. Some people work their whole lives in a kitchen for these honors, but our disposition of “We are anti-chefs” made our “brand” very attractive and novel. Having a chip on one’s shoulder is pretty old-fashioned and unattractive to me. Unless the chip is flavored with salt and vinegar. That’s yummy. In one episode, your chocolate was overcooking in a microwave, but you embraced the “chaotic zen” of the moment and still turned out something the judges loved. How important is it to be fluid in one’s viewpoint? 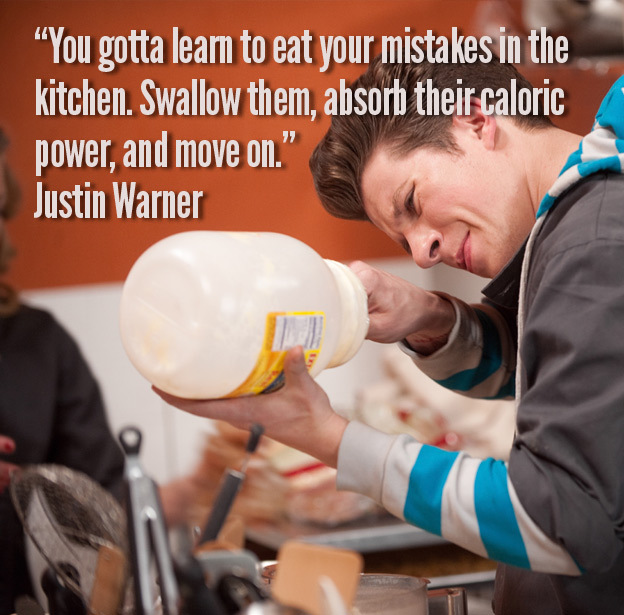 You gotta learn to eat your mistakes in the kitchen. Swallow them, absorb their caloric power, and move on. The party shouldn’t stop because someone dropped a martini glass. You gotta Scotchgard your ego, pick up the broken glass, and make a windchime out of it that your kids can sell to MoMa to defray the bills for your assisted living facility. You come across as very authentic. What impression do you think a brand, or a brand personality, leaves when they are flighty and don’t hold true to themselves? Authenticity is the key to great salesmanship, and salesmanship is something you must practice every day. It’s truly not about things being bought or sold, but rather, about presenting oneself in a manner that others find agreeable, intriguing, and inviting. This doesn’t mean that you have to pander or change who you are, you just have to learn to smooth out the jaggies. Oftentimes in life you have to swim upstream. I find that it is much easier to do so if there are a lot of other fish that say “You know what? You’re a really great fish, and I like the way you do your fish things… why don’t you swim behind me for a bit… it’ll reduce the drag.” I find that there’s always a bigger fish, and chances are that if you can make that fish like what kind of fish you are, the whole swimming upstream thing becomes pretty easy. We got the [New York] Times to write about us because I tweeted them “Yo. We open.” That kind of authenticity got them hooked, pun intended. We didn’t need to have a PR team beg and plead on our behalf, and I think that the Times found that to be refreshingly brash and authentic. We were scrappy anti-chefs doing a scrappy anti-restaurant and we announced it in a scrappy anti-way. Authenticity, start to finish. Any thoughts on keeping brands fresh, relevant and alive? I will say that Dansko is my favorite shoe company, but only because I’ve worn their shoes for 10 years straight. I think the brand world could use my help, a bit. Demographics and psychographics and virality are all crucial things, but I feel like a lot of branding decisions are made from charts and graphs, not by hunches or gut feelings. I think even viral brand campaigns are becoming increasingly formulaic and uninspired. Personally, Justin has my vote (a lot of them in fact). I think he’s the real deal and I’ve noted that both Bob and Susie (did I mention her eyes remind me of Lauren Bacall’s from the Golden Age of Hollywood?) consistently mention “memorable” as a quality (when determining who stays and who goes) and the ability to maintain the viewer’s interest. Justin has those in spades. As a final note, I think the team that develops the show titles is smart. Their choice of words are succinct, punchy, and interesting. Which makes me wonder: How come, with Bobby Flay on the channel’s roster, why they haven’t yet come up with a show devoted to desserts hosted by his female equivalent “Sue Flay” or some special recipes such as “Flay Mignon” or “Flay of Sole”? Maybe it is just a matter of time.